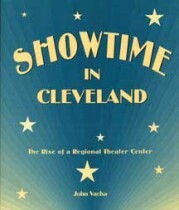 To further the study, appreciation, and celebration of live theater in northeastern Ohio, historian John Vacha's richly illustrated series examines the region's vibrant theatrical companies, past and present. This work takes the reader from the city’s first professional theatrical presentation in 1820, through the heyday of vaudeville, to the grand reopening of the newly renovated Allen Theater in 1999 and the return of touring Broadway shows to Cleveland. In 1820 Cleveland was able to draw a visit from a troupe of professional actors. With no theater in which to perform, the troupe made do with Mowrey’s Tavern on Public Square. In the summers of 1936 and 1937 the Great Lakes Exposition was presented in Cleveland, Ohio, along the Lake Erie shore just north of the downtown business area. At the time, Cleveland was America’s sixth largest city. The Exposition was scheduled to commemorate the centennial of Cleveland’s incorporation and was conceived as a way to energize a city hit hard by the Great Depression. In its first summer the Exposition drew four million visitors and three million more during its second and final season.